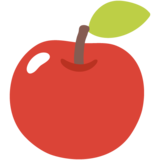 This is how the 🍎 Red Apple emoji appears on Google Android 7.1. It may appear differently on other platforms. Android 7.1 was released on Oct. 20, 2016. All emoji names are official character and/or CLDR names and code points listed as part of the Unicode Standard. Additional descriptions are copyright © Emojipedia. Emoji images displayed on Emojipedia are copyright © their respective creators, unless otherwise noted. Emojipedia® is a voting member of the Unicode Consortium. Emojipedia® is a registered trademark of Emojipedia Pty Ltd; Apple® is a registered trademark of Apple Inc; Microsoft® and Windows® are registered trademarks of Microsoft Corporation; Google® and Android™ are registered trademarks or trademarks of Google Inc in the United States and/or other countries. Follow Emojipedia on Twitter, Facebook, Instagram or Micro.blog.